Finally the wait is over: No need to play with the Google+ business Pages and 50 managers anymore when wishing to start a group on the Plus side. This Hangout will tell you all you need to know about Communities! Google has launched a new feature to its social network, Google+, that will aid in meeting new people. It’s called Google+ Communities and it’s Google’s attempt of competing against Facebook Groups. If there’s something you’re interested in or you’re an expert about, Google+ wants to help give you a chance to connect with others who share your passion and interests. Since its creation, Google+ has been promoted as that place to help people crowd around common interests while also discovering new things and meeting people. Whether it be through Hangouts, Circles, its Explore feature, trending topics, or anything else, there are numerous ways to find conversations happening across the network. But until now, there hasn’t been a centralized area for people to congregate and share their thoughts, photos, beliefs, and information around a specific theme, topic, idea, etc. With 400 million registered users, there’s bound to be at least one or two of them who have something in common. While Google+ Communities are open to the world, they can also be marked private so group members can feel secure with the information that they’re sharing. And you don’t have to visit the Community in order to post something — right from your Google+ home screen, you can insert whatever you want to share and then select the Community Circle where it will appear for everyone in the group to see. As you can see from the above screenshot, Google+ Communities has some interesting hallmarks reminiscent of Facebook Groups. However, there are some differences — instead of looking at specific posts, you can filter it by topics or discussion categories. Photos are a bit larger than you’d see on Facebook and you can even list Events and Hangouts with other members right on the page. In addition, users can share content to the community through the Google+ share box and also can add their +1 to it too. It’s important to note that these Communities are different from company and branded pages — think about those more like Facebook fan pages where the company has control over the content and users interact based on a specific content driver. 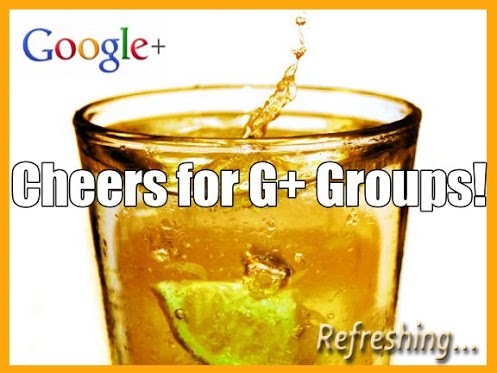 With Google+ Communities, everyone in the group can share whatever they want relating to the topic. They can have chats, dialogue, events, contests, share photos, and much more. Whether you’re interested in photography, astronomy, baseball, cooking, or whatever strikes your fancy, now you can create your own group and meet some new people who would be happy to discuss it with you. What are you going to do with this feature when it shows up? http://plus.google.com/communities links to a 404'd page. Same here. This is the message I get - "The requested URL was not found on this server. That’s all we know." It's rolling out slowly, within 24 hours you should all get it!